Located in the region of the southern Caucasus Mountains, Azerbaijan borders the Caspian Sea to the east, Georgia and Russia to the north, Iran to the south, and Armenia to the southwest and west. A small part of Nakhchivan also borders Turkey to the northwest. The capital of Azerbaijan is the ancient city of Baku, which has the largest and best harbor on the Caspian Sea and has long been the center of the republic's oil industry. Except for its eastern Caspian shoreline and some areas bordering Georgia and Iran, Azerbaijan is ringed by mountains. To the northeast, bordering Russia's Dagestan Autonomous Republic, is the Greater Caucasus range; to the west, bordering Armenia, is the Lesser Caucasus range. To the extreme southeast, the Talysh Mountains form part of the border with Iran. The highest elevations occur in the Greater Caucasus, where Mount Bazar-dyuzi rises 4,466 meters above sea level. Eight large rivers flow down from the Caucasus ranges into the central Kura-Aras Lowlands, alluvial flatlands and low delta areas along the seacoast designated by the Azerbaijani name for the Mtkvari River (Kura) and its main tributary, the Aras. The Mtkvari, the longest river in the Caucasus region, forms the delta and drains into the Caspian a short distance downstream from the confluence with the Aras. The Mingechaur Reservoir, with an area of 605 square kilometers that makes it the largest body of water in Azerbaijan, was formed by damming the Kura in western Azerbaijan. The waters of the reservoir provide hydroelectric power and irrigation of the Kura-Aras plain. Most of the country's rivers are not navigable. About 15% of the land in Azerbaijan is arable. Azerbaijan is nearly surrounded by mountains. The Greater Caucasus range, with the country's highest elevations, lies in the north along the border with Russia and run southeast to the Abseron Peninsula on the Caspian Sea. The country's highest peak, Bazardyuze Dagi, rises to 4,485 m in this range near the Azerbaijan-Russia border. The Lesser Caucasus range, with elevations up to 3,500 m, lies to the west along the border with Armenia. The Talish Mountains form part of the border with Iran at the southeast tip of the country. Kobustan Mountain, located near Baku, is carved by deep ravines, from which bubble mud volcanoes and mineral springs. The climate varies from subtropical and humid in the southeast to subtropical and dry in central and eastern Azerbaijan. Along the shores of the Caspian Sea it is temperate, while the higher mountain elevations are generally cold. Baku, on the Caspian, enjoys mild weather that averages 4 °C (39.2 °F) in January and 25 °C (77 °F) in July. Physiographic conditions and different atmosphere circulations admit 8 types of air currents including continental, sea, arctic, tropical currents of air that formulates the climate of the Republic. The maximum annual precipitation falls in Lenkeran (1,600 to 1,800 mm.) and the minimum in Absheron (200 to 350 mm.). The maximum daily precipitation of 334 mm was observed at the Bilieser Station in 1955. NASA satellite image of Azerbaijan. Air and water pollution are widespread and pose great challenges to economic development. Major sources of pollution include oil refineries and chemical and metallurgical industries, which in the early 1990s continued to operate as inefficiently as they had in the Soviet era. Air quality is extremely poor in Baku, the center of oil refining. Some reports have described Baku's air as the most polluted in the former Soviet Union, and other industrial centers suffer similar problems. The Caspian Sea, including Baku Bay, has been polluted by oil leakages and the dumping of raw or inadequately treated sewage, reducing the yield of caviar and fish. In the Soviet period, Azerbaijan was pressed to use extremely heavy applications of pesticides to improve its output of scarce subtropical crops for the rest of the Soviet Union. The continued regular use of the pesticide DDT in the 1970s and 1980s was an egregious lapse, although that chemical was officially banned in the Soviet Union because of its toxicity to humans. Excessive application of pesticides and chemical fertilizers has caused extensive groundwater pollution and has been linked by Azerbaijani scientists to birth defects and illnesses. Rising water levels in the Caspian Sea, mainly caused by natural factors exacerbated by man-made structures, have reversed the decades-long drying trend and now threaten coastal areas; the average level rose 1.5 meters between 1978 and 1993. Because of the Nagorno-Karabakh conflict, large numbers of trees were felled, roads were built through pristine areas, and large expanses of agricultural land were occupied by military forces. Like other former Soviet republics, Azerbaijan faces a gigantic environmental cleanup complicated by the economic uncertainties left in the wake of the Moscow-centered planning system. The Committee for the Protection of the Natural Environment is part of the Azerbaijani government, but in the early 1990s it was ineffective at targeting critical applications of limited funds, establishing pollution standards, or monitoring compliance with environmental regulations. Early in 1994, plans called for Azerbaijan to participate in the international Caspian Sea Forum, sponsored by the European Union (EU). Local scientists consider the Abseron Yasaqligi (Apsheron Peninsula) (including Baky and Sumqayit) and the Caspian Sea to be the ecologically most devastated area in the world because of severe air, water, and soil pollution; soil pollution results from the use of DDT as a pesticide and also from toxic defoliants used in the production of cotton. 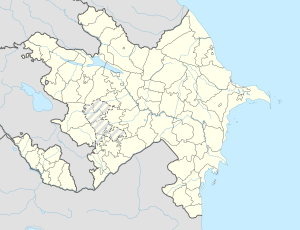 Note: Includes the exclave of Nakhchivan Autonomous Republic and the Nagorno-Karabakh region; the region's autonomy was abolished by Azerbaijani Supreme Soviet on November 26, 1991. ^ a b "CIA Site Redirect — Central Intelligence Agency". www.cia.gov. Retrieved 2018-03-07. ^ "The World Factbook — Central Intelligence Agency". www.cia.gov. Retrieved 2018-03-07. ^ "Azərbaycan :: Baş səhifə". www.azerbaijans.com (in Azerbaijani). Retrieved 2018-03-07. ^ "Hydromet Azerbaijan". Web.archive.org. Retrieved 2018-10-02.